Being pregnant is like going on a diet with specific things you can’t eat for a really long time… except instead of getting thinner, you get FATTER. Basically what I’m trying to say is, as soon as I have this baby, I’m getting some raw sushi, raw oysters, and tons of moldy cheese like gorgonzola and bleu cheese. And maybe a big pile of lunch meat to top it all off. The last time I posted about pregnancy was on week 17. Oops. 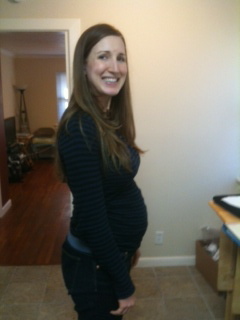 At least now I actually have a legitimate belly bump to show for it! Maternity clothes? Yes, finally. Most of my shirts are too short now, and my regular jeans are long past the fitting point. Best moment last week? He poked some body part up and kept it there for a while. I actually got to feel the hard spot on my belly for a few seconds before he moved again. Movement? Lots, especially while I’m sitting at my desk at work. Food cravings? Unfortunately I haven’t had any legitimate cravings yet. Stephen wishes I would have some weird craving just for the comedic value, and I’m sad to say I’ve let him down thus far. I’m feeling quite large and unwieldy, and I can’t imagine getting ANY bigger. 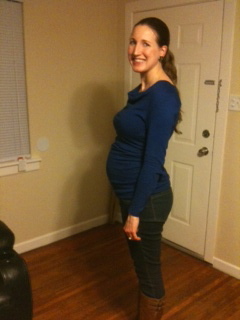 I know all you ladies who have had children are laughing at me right now, but I feel like a whale. But I know my stomach is going to get a whole lot bigger before that baby ever comes out of it, so I’m sure I’ll look back at this post and wonder how I ever thought I was already huge. We shall see. You look great Hannah! So happy for you!